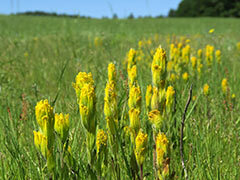 The main botanical attraction at William L. Finley National Wildlife Refuge is the golden paintbrush (Castilleja levisecta), which used to be extinct in Oregon but has been reintroduced in a few protected areas. It seems to be doing well. Since I was in the neighborhood, I also stopped by Mary's Peak, about 12 miles west of Finley NWR. It was too early for most wildflowers; there were still a few patches of snow near the summit.